Invasive plant removal in progress at Oyster River Forest. 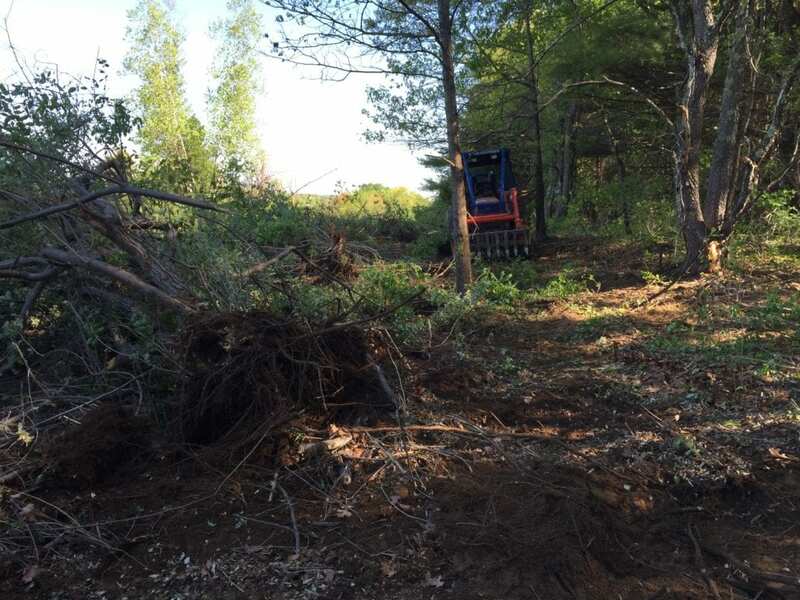 In September of 2014, the eight-acre, abandoned West Field on Oyster River Forest was cleared of invasive shrubs by uprooting and shredding. This was a superior alternative to herbicides because it eliminated the risk of watershed and aquifer contamination; left no standing dead shrubs; smoothed and prepared planting sites in the process of shredding, which greatly speeded site restoration since the old field was transformed and ready for replanting of desirable shrubs in a week; and was cost competitive. Uprooting invasive shrub prior to shredding virtually eliminates resprouting. 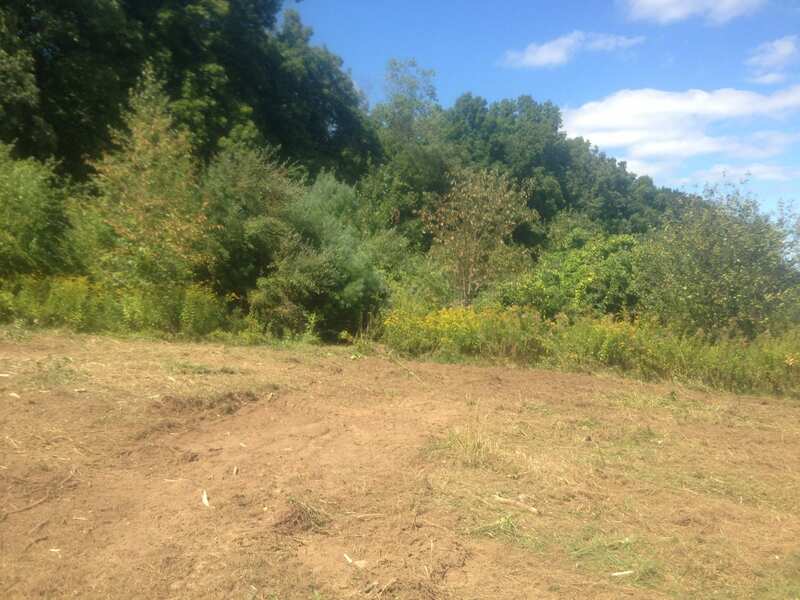 In the foreground, invasive shrubs and scrub white pines have been uprooted and shredded. The same area six months later in May 2015. If you look carefully you can see the shrubs that were planted immediately after the site was cleared of invasive shrubs. The new plantings improve the habitat for New England cottontail rabbit and other wildlife. The bi-directional clearing rake roots out small invasive trees and shrubs, pushes aside obstacles such as rocks and logs, and fills in holes and ruts. It can also comb backwards to sweep up scattered limbs and debris and works very well for uprooting and pulling down invasive vines. 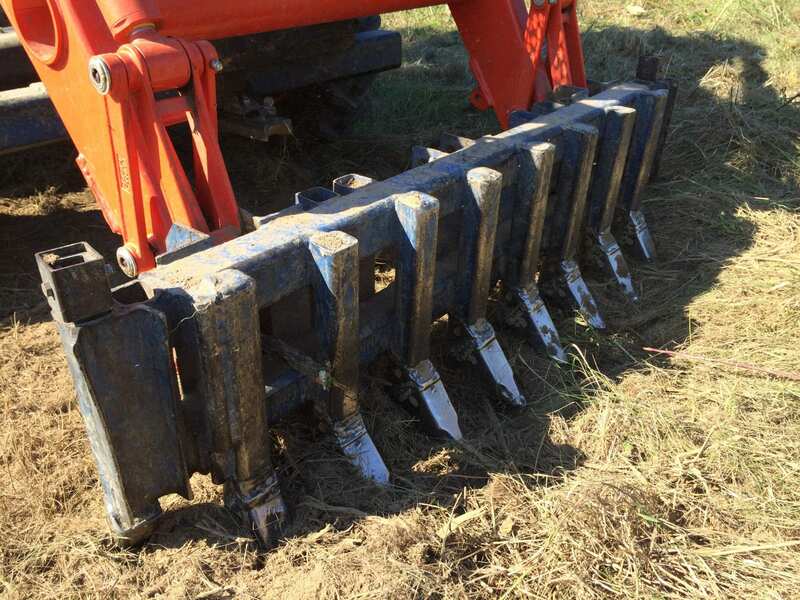 After uprooting the invasive shrubs, their root wads were shredded with the extreme duty shredder fitted with carbide hammer teeth that withstands impacts with rocks and are not damaged by dirt. We used the extreme duty shredder to smooth a badly rutted trail through the middle of the field. 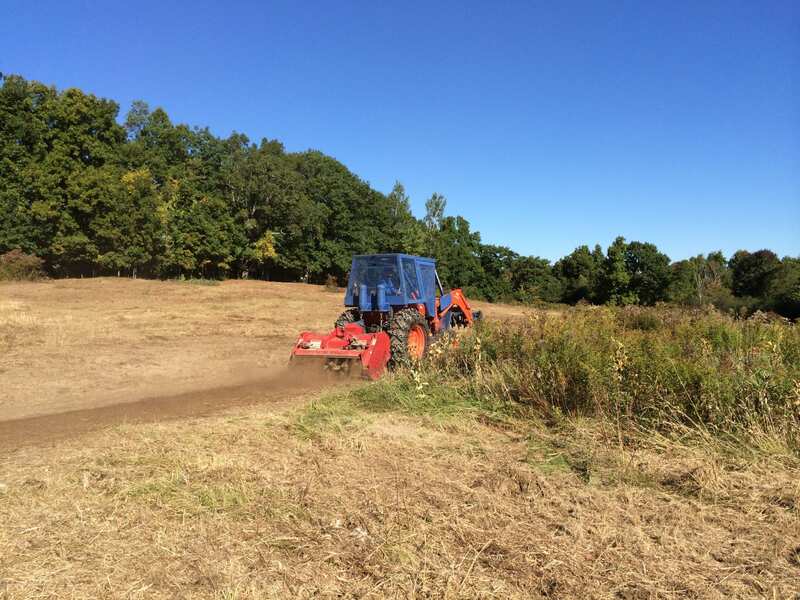 Shown to the right of the shredder, patches of desirable vegetation, such as milkweeds, blackberries, and goldenrod were left intact. 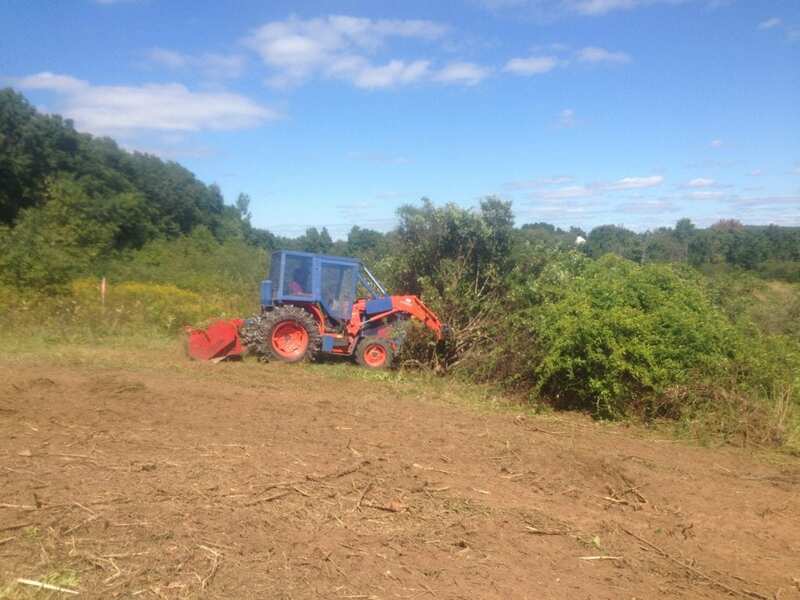 The 60 hp tractor with its clearing rake and shredder was small enough to remove invasive shrubs between the trees at the edge of the field, yet powerful enough to be very effective. 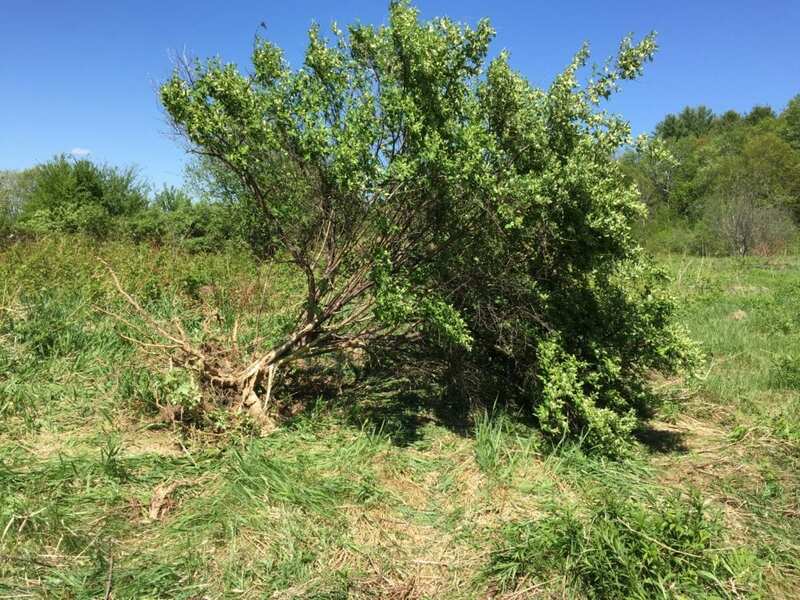 May 2015 – Very little resprouting of invasive shrubs had occurred where they were uprooted and shredded in September. 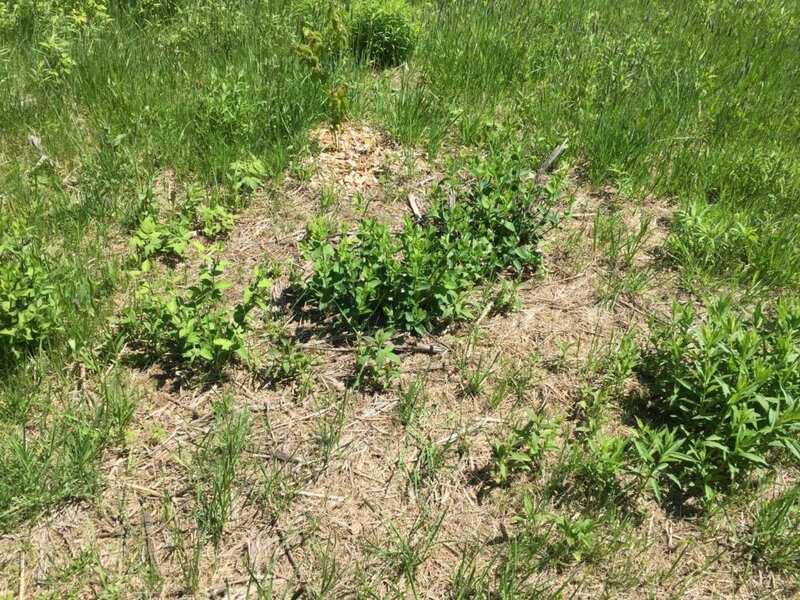 May 2015 – Where invasives shrubs were just shredded and not uprooted in September, there was considerably more resprouting. However shredding shatters the stumps, so there is less resprouting than if the stumps had been cleanly cut. 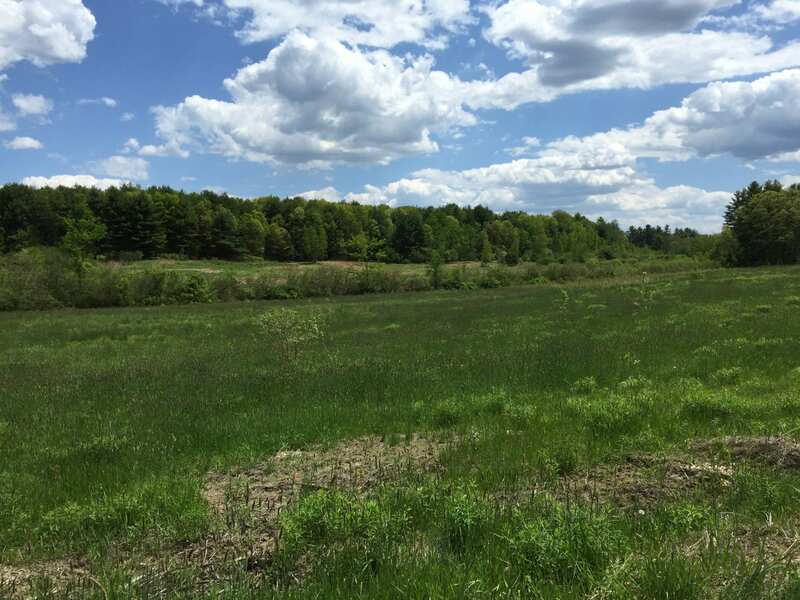 In May 2015, we removed invasive trees and shrubs on an additional 11 acres of the old East Field. Here uprooted buckthorn and invasive shrubs along the edge of the East field are ready for shredding. Often shredding is done immediately after uprooting. 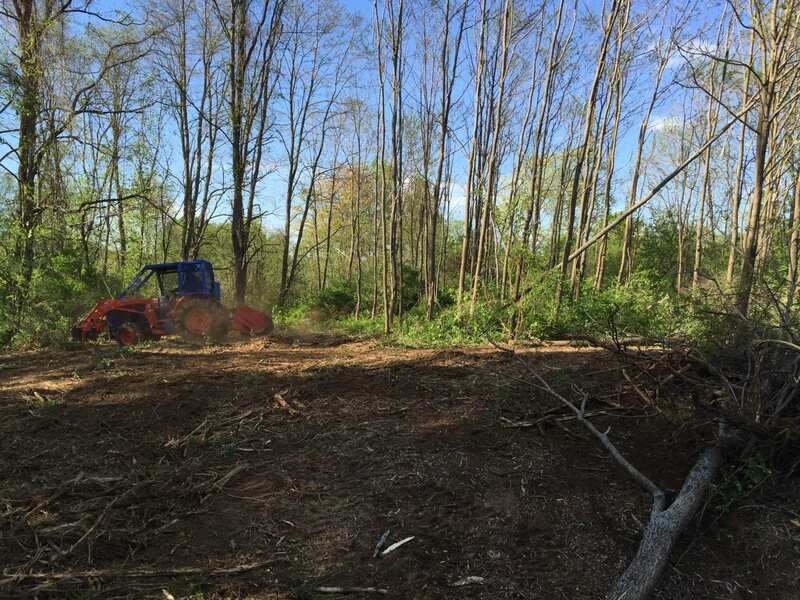 At the north end of the East field, we uprooted and shredded virtually impenetrable multi-flora rose in the understory of a one-acre stand of black locust. 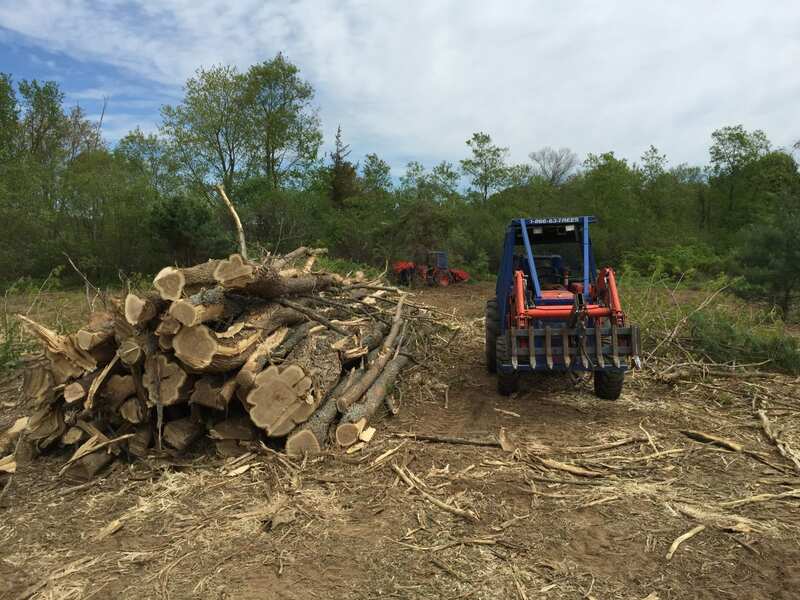 Using one of Forest Savers’ tractors fitted with a Turbo Saw on the rear, we cut and piled the black locust. 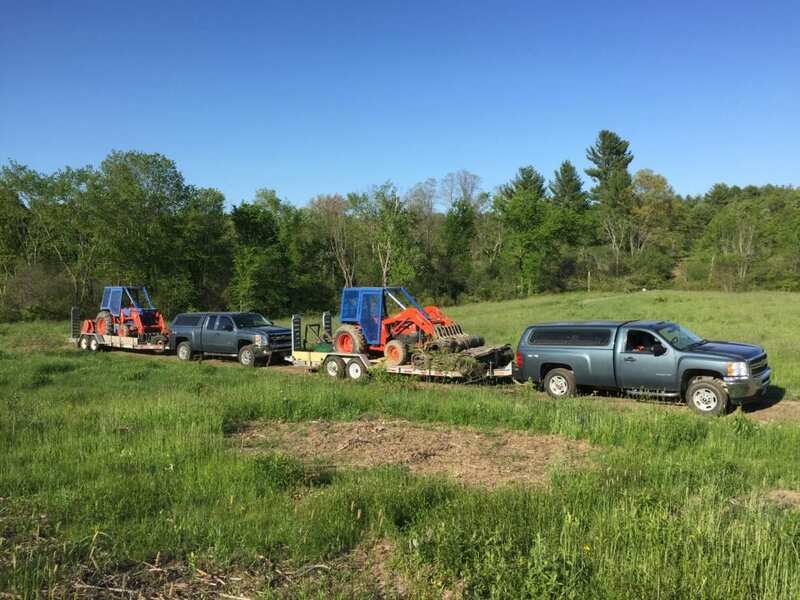 On the front trailer, in addition to the tractor, you will see four rolls of seven-foot-wide tire matting totaling 56 feet in length that was used to stabilize the approaches to a stream crossing. The compact size of the Forest Savers tractors makes it easy to transport them quickly and inexpensively between sites. 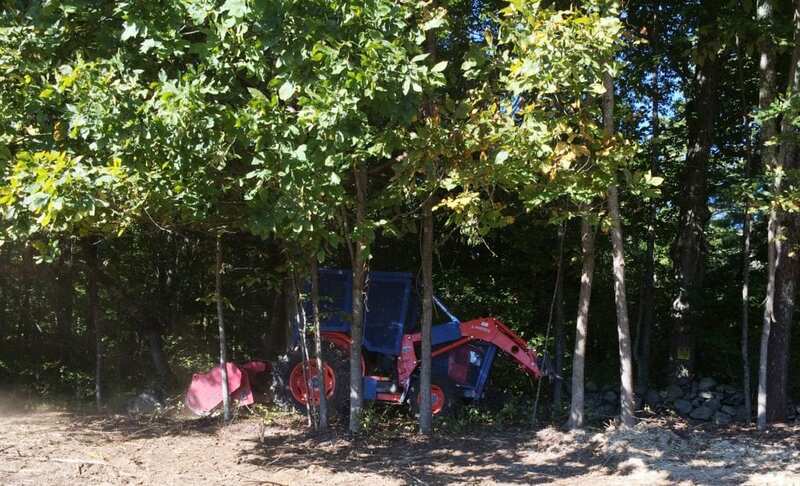 The ability to efficiently carry out multiple tasks, such as grubbing out entire shrubs and small trees – roots and all, shredding the woody tops and root wads into mulch that blends into the ground, preparing sites for planting, smoothing roads and trails, mowing grass, and piling rocks and logs, with just one compact machine makes the work go faster with better results, for less cost. Gerry Hawkes owns Forest Savers LLC, a company dedicated to providing innovative and effective services for controlling heavy infestations of woody invasive plants and unwanted brush without the use of herbicides. 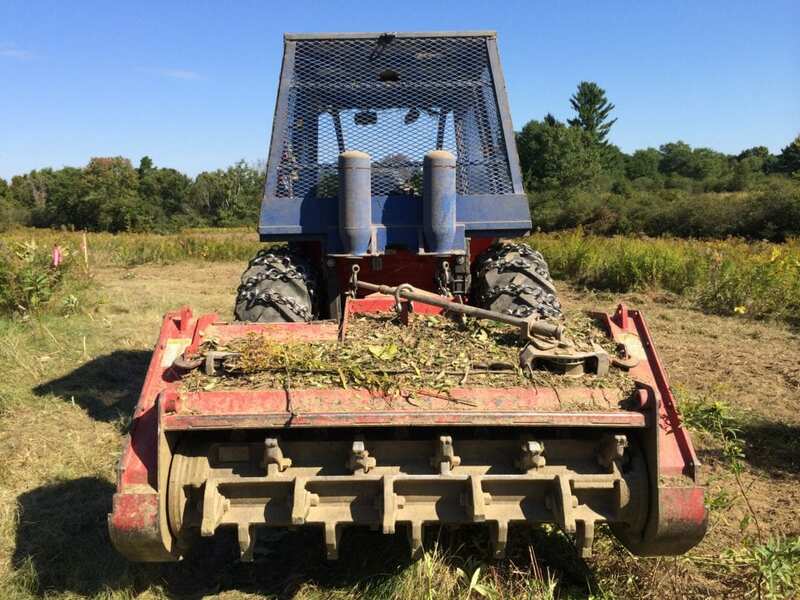 While large acreages can be efficiently treated, this service is particularly well suited for home owners who have invasive brush and tick habitat around their yards and in the wooded areas between homes. There are videos and a lot more photos on the Forest Savers website.